Tucked away at the end of a lane in on the border between Carmarthenshire & Ceredigion, Henfryn is a hidden gem. 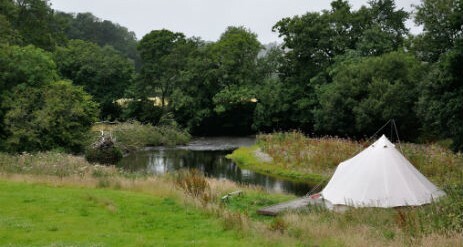 This small organic farm nestled on the banks of the river Teifi offers glamping and camping opportunities for families and couples alike. The focus at Henfryn is very much on sustainability and nature, yet with every thought given to the things needed for a memorable stay. Enjoy the lovely views down to the river, have a camp fire and relax in beautiful surroundings, meet the animals and even go for a paddle. We are a stone’s throw from the West Wales Costal Path, lovely beaches, the beautiful Preseli Mountains and many gardens, museums and local attractions. 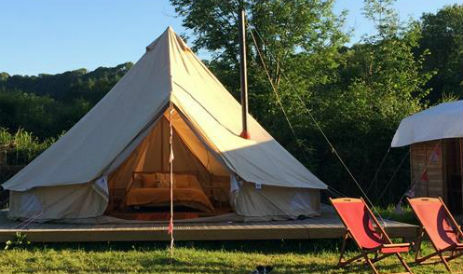 We have 3 Bell Tents available from April to September, two accommodating up to four people, and one larger tent which can sleep six. 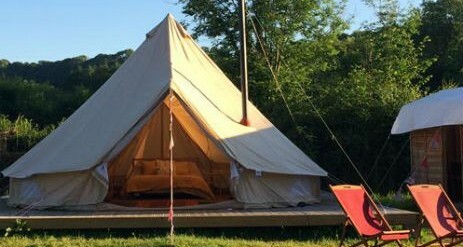 Each gives an off grid camping experience with a touch of Glamping luxury. 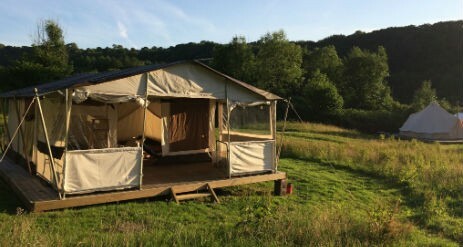 We also have a spacious Safari Tent, perfect for families wanting more space or a longer stay. It can sleep 6. There is also a stunning Shepherds Hut style living van, open year round, affectionately known as the Commander’s Caravan. It is the perfect retreat for a romantic break for 2 with its king-size bed, private bathroom facilities and even its own wood fired hot tub. 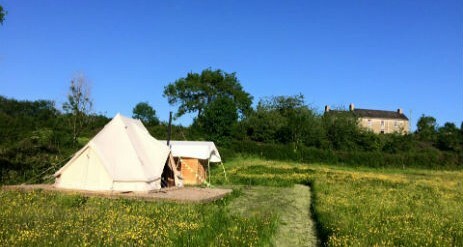 We also have 2 grass camping pitches if you want to bring your own tent. This is a working farm so expect to see cows, sheep, geese and chickens. Collect some fresh eggs for your breakfast or try a couple of our delicious steaks or burgers from the freezer for your BBQ! We also brew Cider & Perry! 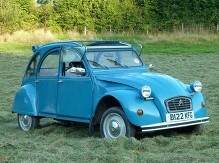 Introducing “Son Of Herman” – our classic 2CV – all set for you to hire to explore the lanes and byways of this beautiful area – in inimitable style. With the roof rolled back and the side windows flipped up, Son of Herman is ready to waft you along the lesser known routes of the Teifi valley, floating on super soft suspension, propelled by a free-revving and economical flat twin engine. Driving ceases to be merely about getting from A to B. It becomes an experience in itself. You become literally immersed in the Welsh countryside. Sunshine, fresh air and passing insects drift in through the open roof. As you hum through a village, small children shout and wave, older folk stop and smile. You pause for a picnic by the wayside and in minutes you take the back seat out to provide you with a comfortable bench and unpack your hamper of goodies. Later, as you continue on your journey, a passing shower is quickly thwarted by an ingenious fabric roof that rolls out as quickly as it rolls up. And finally, as the shadows lengthen in the leafy lanes, you thread your way back through the patchwork of fields to the farm. You finish your day feeling that, for perhaps the first time in a while, you have not only been somewhere, but you have travelled somewhere…. 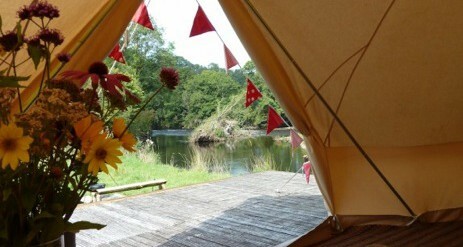 Bell Tents & Safari Tent- from £130 for 2 nights to £510 for 7 nights. Commander’s Caravan from £200 for 2 nights to £560 for 7 nights. 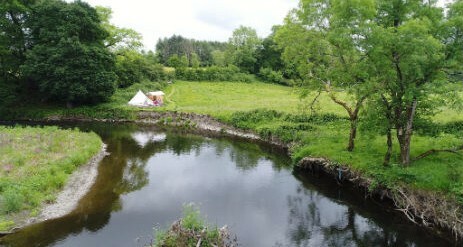 Camping Pitches are from £20 per night. We have a minimum stay of 2 nights.